The year is 212 B.C.E. The legend goes that Greek mathematician Archimedes, in an attempt to fight off a Roman invasion fleet, used a giant parabolic mirrors to concentrate sunlight on enemy ships, hoping to set them on fire. It is perhaps the earliest recorded attempt to weaponize light-though like many of the attempts to come, it would not be successful. Archimedes died shortly after the Romans took the city. In the two millennia since, humans have been seeking new way to harness the power of light and use it against one another. Most of these sci-fi-inspired contraptions take the form of direct energy weapons (think laser weapons). Some, like last week's latest report of a Russian weapon that "induces hallucinations and vomiting," attempts to harness the power of strobe. Such a weapon certainly sounds exotic, and any claim of advanced Russian weaponry should be taken with a grain of salt. But this is not the first strobe weapon ever conceived-not by a long shot. Scientists have been trying to create weapons for decades using only flickering light. They're built puke rays and strobe tanks and amnesia devices in an attempt to divine the ultimate weapon. Getting any of them to actually work hasn't been so simple. Like so many weapons technologies of the 20th century, the strobe light's story begins with the world at war. During WWI, searchlights were mounted on vehicles to provide lighting for night actions. By WWII, the British had come up with the idea of a light that could be flicked on and off rapidly. At the time it was thought that this would cause temporary blindness by preventing the eye from adapting to either light or dark. U.K. forces mounted 13-million-candlepower carbon-arc lights on the turrets of M3 Grant tanks, while keeping the tank's main armament, a 75-mm gun, in the hull. This top-secret arrangement was codenamed Canal Defense Light, or CDL. The idea was that a line of CDL tanks would go at the front of an attack, making everything behind them effectively invisible. In one test, a 25-pounder gun fired continuously at an advancing CDL tank, but was unable to score a hit due to the dazzling light. General Eisenhower, then supreme allied commander, was so impressed that he ordered an equally hush-hush version for U.S. forces, codenamed Shop Tractor. The allies maintained such secrecy because they feared that Germans would develop dark filters as countermeasures. But secrets bring inherent disadvantages, too. Commanders simply did not know about the CDL, so supporting troops had not been trained to work with it and there was a reluctance to rely on an unproven weapon. Because of this, the strobing searchlight was never used in action. "I regard the failure to use this tank as the greatest blunder of the whole war," Major General Fuller, one of the great tank warfare theorists, said in 1949. Fuller also said that American and British forces might have reached Berlin before the Russians if the CDL had been used. But this is not a universally held opinion; other theorists said the CDLs would have been easy targets for German 88mm guns using filters designed for bright sunlight. But the effects remain elusive and hard to reproduce. In the 1960s and 70s, a British-designed device called Photic Driver was described as "a simple modification of a discotheque device," for the use of non-violent crowd control. But none of these devices have been effective, and police continue to rely on tear gas and rubber bullets. One of the more bizarre spin-offs was research into whether it was possible to induce amnesia with flashing lights, much like the Neuralyzer from Men in Black. This technique had been shown to work with laboratory rats in Air Force experiments, but ultimately the research hit a dead end. Then again, if they ever developed a real-life Neuralyzer, would we ever know? Strobe weapons took a shining leap forward in the 2000s with new high-intensity LED flashlights. Police began using strobing versions of these flashlights, but still with middling effects. While some officers reported that they could briefly confuse suspects, there was little scientific evidence to back those claims. Then, in 2007, Intelligent Optical Systems developed the LED Incapacitator under contract for the Department of Homeland Security. The weapon was quickly nicknamed the "vomit flashlight" and "puke saber." The LED Incapacitator has a packed array of colored, flashing LEDs that emit a variable pattern discovered to affect the most people, causing nausea, vertigo, and disorientation. With the promise of subduing suspects safely, TIME voted it one of their top inventions of 2007. Despite all the media reports, the actual effects were not that dramatic. "I don't think we've had anyone actually be sick," IOS CEO Bob Leiberman told me in 2008, and while the LED Incapacitator continued testing through 2009, the results haven't justified the original excitement. The device never went into production. While the Puke Saber ended up on the cutting room floor, other portable strobe weapons had more luck with more modest claims. The Dazer Lazer is a green laser that emits a flashing light. Its main purpose is to dazzle the target, preventing them from shooting effectively or taking other action, but the flashing is also claimed to produce additional effects: "the threat's equilibrium and awareness is impaired which, in some cases, may be followed by a feeling of nausea (motion sickness)." Meanwhile, others were thinking bigger. In 2007, the U.S. Army's Research Development and Engineering Command awarded a contract for a device which could be fitted to a drone so it could immobilize groups of people with a beam of flashing light. This "Light Based Immobilization/Deterrent Device" was based on a Xenon searchlight made by Peak Beam Systems with a strobe function and was intended to produce "immobilization to those within the beam" with a range of five hundred feet. Will Harcourt, CEO of Peak Beam Systems, told me that while the strobe would not "put someone in a state of suspended animation," the effects would make it difficult to move around and could cause dizziness and nausea. Fast-forward 12 years later, and you won't find many flashing drones incapacitating large groups of people. But Peak Beam's strobing searchlights have found their way onto U.S. military vehicles. 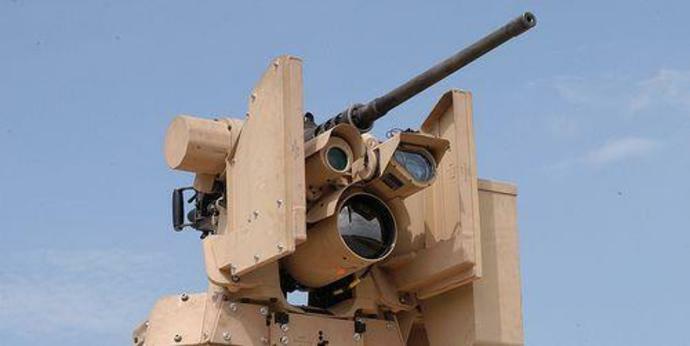 For example, the CROWS II Escalation of Force Kit is a turret equipped with a dazzling laser, strobe light, and LRAD "sound cannon" to provide multiple methods of warning, hailing, and deterring. Peak Beam does not claim the current light strobes will completely immobilize, but they will produce "decreased hand-eye coordination and nausea." For the past few decades, strobing weapons have occupied the thoughts of mostly American and British engineers. Now Russians are entering the world of strobe weaponry. According to the state news agency RIA Novosti, a new defensive system called "Filin" has been installed on two Russian warships. Filin is a strobe light "designed to suppress at night and at dusk visual-optical and optical-electronic channels of observation and aiming of small arms." In other words, it makes Russian ships harder to see. The makers, Ruselectronics, claim that in addition to producing an after-image of "spots of light floating before the eyes," some 45 percent of those exposed also experienced sensations of dizziness, nausea, or disorientation. Filin has an effective range of five thousand meters, and has been fitted to two frigates, Kasatonov and Gorshkov. It will do nothing to defend against anti-ship missiles or other major threats but could be useful when dealing with pirates, smugglers, or others in small boats desperate enough to try shooting their way out. But Filin doesn't look like much of an advance over the Canal Defense Light, developed more than 75 years ago. It is possible that Filin might be used to harass U.S. vessels, but-at least for now-this is one arms race where America holds a commanding lead.